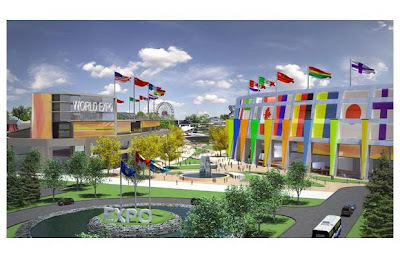 Artist's rendition of the Expo that could have been. Ever have your mom tell you that you could go to a movie, then change her mind and say you can't? How about a boss that approves an expenditure for upgrading your office, who retracts the offer before you can cash in on it? Ever have a federal government encourage and support you in bidding to hold a world exposition in your city, only to change their mind at the last minute with tenuous reasoning? It's a lousy feeling. It's grossly unfair. It's a tremendous amount of money wasted pursuing a special event that's not going to happen. But is the money actually wasted?